The overuse of antibiotics to treat infections that should not be treated with antibiotics (apparently, one third of Americans believe that antibiotics can cure the flu). The relative disincentive for pharmaceutical companies to invest in expensive and long-winded antibiotic drug development compared to cancer drug development, for example, because the latter drugs are used to treat a chronic disease whereas antibiotics are only taken by patients for a short time. Things are not all that bad, however, despite the fact that the word “pharmageddon” has been used to describe the scenario in which we have no effective antibiotics left to treat even the simplest bacterial infections. Only a couple of weeks ago Ling et al. (2015), reporting in Nature, described a new type of antibiotic termed teixobactin. [Comment on this paper can be found here.] 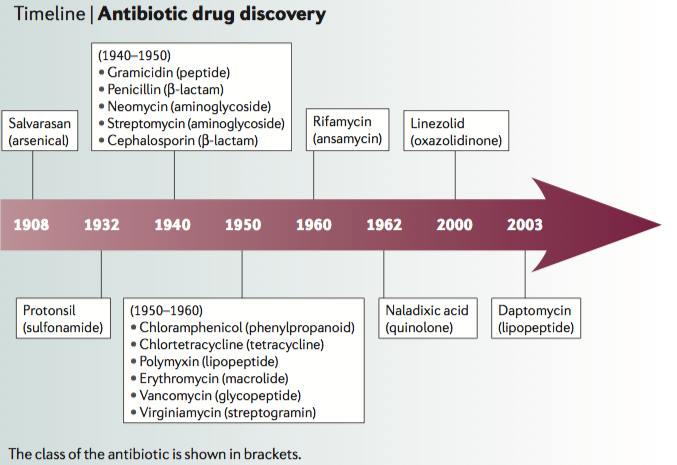 In essence, they used the same conceptual approach as scientists in the 1950s: they “mined” for antibacterial compounds already existing in nature. The reason this has not been successful since the “golden era” is because 99% of bacterial species found in soil, for example, cannot be cultured under standard lab conditions, and so the vast majority of potential new drugs has been missed. Ling et al. circumvented this problem by culturing bacteria “in situ“, that is in their natural environment and/or with the addition of growth hormones. They then tested various compounds they found against Staphylococcus aureus and Mycobacterium tuberculosis and recovered teixobactin, which inhibits bacterial cell wall synthesis – eukaryotic cells (which include human cells) do not have a cell wall and thus the drug target is only available in bacteria. Teixobactin is produced by the bacterium Eleftheria terrae, which was not known to produce antibiotics. Hopefully this paper will a) fuel further research of this kind to uncover additional new classes of antibiotics, and b) lead to the development of teixobactin as a drug used in the clinic. Although less directly related to bacteria, a new CRISPR paper was published a couple of days ago, also in Nature (Konermann et al. (2015); comment here). It demonstrates a proof-of-principle that the CRISPR/Cas9 system can also be used for transcriptional activation on a genome-wide scale, rather than genome-editing and gene knockout creation. The paper comes from Feng Zhang’s lab at MIT and in several ways is a follow-up on their previous publication (Shalem et al. (2014)): in the earlier paper they use CRISPR to knockout genes in the A375 melanoma cell line to establish which genes might be implicated in resistance to the drug vemurafenib. In this year’s paper they tested which genes, when overexpressed, led to vemurafenib resistance. Reassuringly, they found genes that were already known to mediate resistance, such as the EGF receptor and several G-protein coupled receptors, but also implicate new genes, such as those coding for ITG receptors, in the resistance mechanism. This entry was posted in CRISPR, Factual and tagged antibiotic resistance, biology, Cell biology, CRISPR, Genome-editing, melanoma, Science, tool, Translational Medicine by Victoria Wang. Bookmark the permalink.